Rajasthan, the state that is home to maximum number of Heritage Hotels in India. Since time immemorial, Rajasthan has been the land of the brave and the royal. The zeal for beauty among the former kings and queens is clearly reflected in the awe-inspiring architecture of its Heritage Hotels Sprawling over miles of golden glowing sands, Heritage Hotels stand as testimonials to the glory and sumptuousness of the bygone eras of Rajasthan. The innumerable forts, palaces, mansions and havelis in Rajasthan have been converted into Heritage Hotels. Each of them has been scrupulously planned and sensitively redone to cater to the essential requirements of tourists helping them get the authentic royal feel of the land. Elegantly furnished with the best in luxurious comforts, Heritage Hotels are a perfect stay option for discerning travellers to Rajasthan. The lavish decor and rustic ambience is coupled with unusually warm hospitality to make your stay memorable at the Heritage Hotels. Tucked away in the age-old Aravali hills of Rajasthan, the 18th century Devi Garh Fort Palace, in the village of Delwara. The actual construction of the fort palace started only in the 1760s, under Raghudev Singh II, with further additions being made to the structure by the rulers who followed. Originally a hunting lodge frequented by the royalty of Mewar, this Royal Retreat, is set amidst the serene, wooded Aravalis. For wildlife and adventure buffs, there is a licensed Deer Park and also a provision for horseback excursions into the sanctuary. The hotel also has a private airstrip, a cricket ground where matches are organized regularly. A Grand Heritage Palace, the imposing lakeside Fateh Prakash Palace Hotel Udaipur recapitulates royal traditions and lifestyles in its traditional furniture, original paintings and luxurious interiors. Its tranquil premises and picturesque views of Lake Pichola, Jagmandir Island Palace, Lake Palace and the Sajjangarh Fort, promise a soothing break from the rigors of city life. 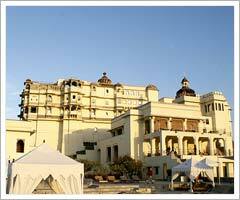 The Shiv Niwas Palace Hotel Udaipur was originally Maharana Fateh Singhji's residence. The rooms around this awe-inspiring courtyard were used as a place for entertaining personal guests. Shiv Niwas Palace Hotel Udaipur was the vision of the His Late Highness Maharana Bhagwat Singhji Mewar, which led to its conversion into a luxury hotel. Shiv Niwas Palace Hotel Udaipur is now categorized as a Grand Heritage Palace as it has been restored to its original immaculate fame.